Origen was one of the most influential pre-Nicene church fathers, whose exegetical method shaped much of subsequent interpretation of the Old Testament. Some of his theological speculations were condemned in the 6th cenutry, but his influence as a Christian scholar and Old Testament exegete remain undiminished. 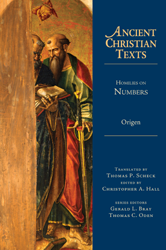 This book offers a fresh, contemporary translation of Origen's 28 homilies on the book of Numbers.